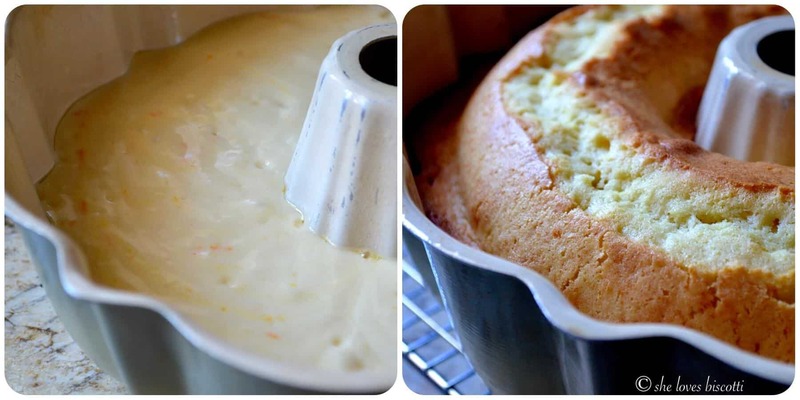 Home » Breakfast and Brunch » Italian Citrus Ring Cake -only 10 minutes to make! 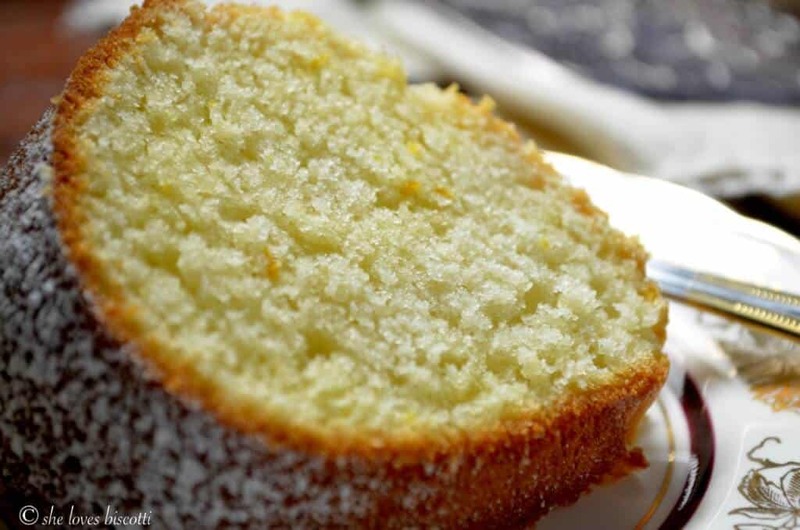 This Italian Citrus Ring Cake recipe, aka Ciambella, is a ring shaped sponge cake. This Italian breakfast cake is great with lots of fruit or to dunk in your morning coffee. Simple. Classic. Italian. During my teenage years, I distinctly remember a simple Italian cake my Mom used to make every Sunday morning. She called it the 8 ounce cake, and when I will share the list of ingredients, you will understand why. 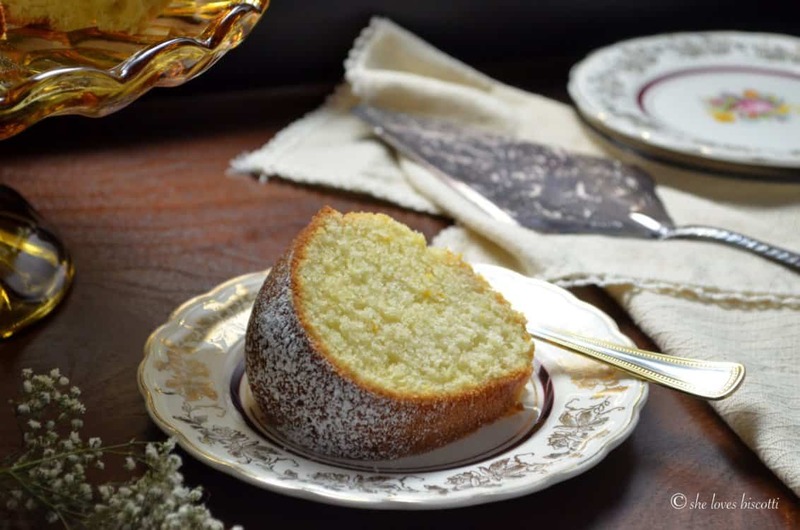 It is my pleasure to share with you my mom’s recipe for a Traditional Italian Citrus Ring Cake aka Ciambella. Having fruit for dessert was normal in my childhood. (And as a dietitian and a mom, I tried to make it the norm in my kids’ childhood, too!) But when I reached my teenage years, my Mom began supplementing the fruit with all kinds of wonderful baked goods -especially simple Italian cakes. I guess she had more time to experiment in the kitchen as her kids got older, something I can definitely relate to. This homemade lemon cake from scratch was one of the stars of the baked goods show, especially on Sundays (aka family day). Ciambella was certainly a family favorite, and the fact that it only needs about 10 minutes of prep time definitely helped its claim to fame in my parents’ house! 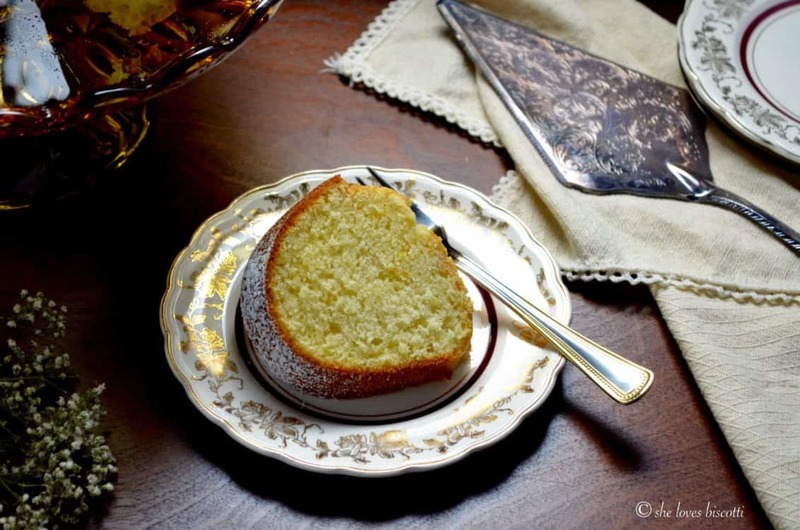 This moist lemon cake recipe that I’m sharing with you today might be called an Italian version of the bundt cake. You’ll notice that the ingredients in this particular recipe are very rustic, and you would most likely have them all on hand on any given day. That, in my opinion, makes this the perfect no-fuss Italian breakfast cake… perfect for dunking in your coffee! You’ll also notice that eggs are a key ingredient in this recipe, as they are in almost all Italian cake recipes. Food chemistry time: did you know that, in a cake, eggs serve to bind all the other ingredients together? On the topic of eggs… Decades later, when I had kids of my own, my Mom stopped making this easy lemon cake recipe in favor of an Orange Chiffon Cake that required a whopping 6 eggs! As with a lot of the recipes my Mom used to make, I can only assume that it was a recipe made by her Mom. After all, that is how traditions start… and I’m very pleased to keep this tradition going. Some other traditional Italian recipes that I still make to this day include Cavatelli and this recipe for Pasta and Lentils. …especially because I actually didn’t use her exact recipe 🙂 For the record, my Mom’s recipe required 1 cup each of sugar, oil, and milk (hence the “8 ounce cake” nickname). I reduced the amounts of oil and sugar (and milk) to 3/4 cup… I guess I’ll have to start calling this the “6 ounce Italian cake” instead. I like to serve this recipe for Traditional Italian Citrus Ring Cake with a simple dusting of confectioner’s sugar and lots of fresh fruit. 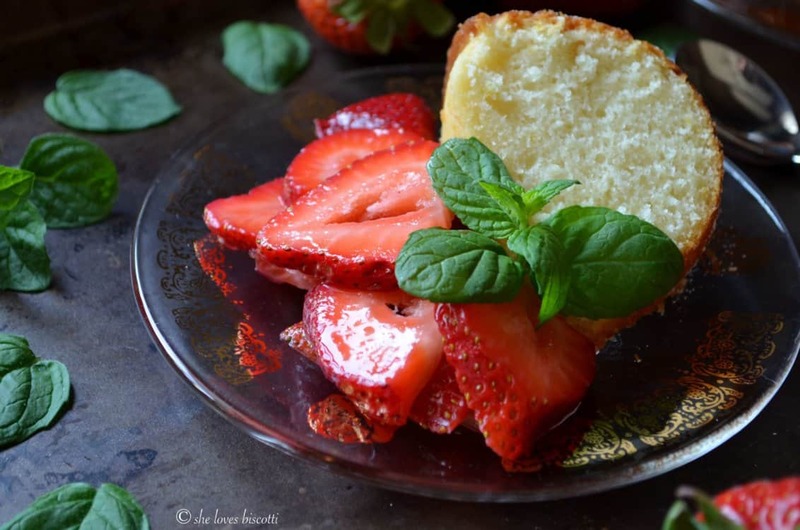 Sometimes, I’ll serve it with this recipe for Macerated Strawberries. You can also drizzle it with a lemon or orange glaze, to really compliment the flavors within. 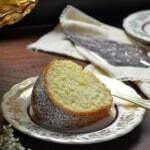 Have this Italian cake aka Ciambella with breakfast, brunch, or afternoon tea… it’s great as a snack or dessert! ★★★★★ If you have made this Italian Lemon Cake recipe, I would love to hear about it in the comments below and be sure to rate the recipe! 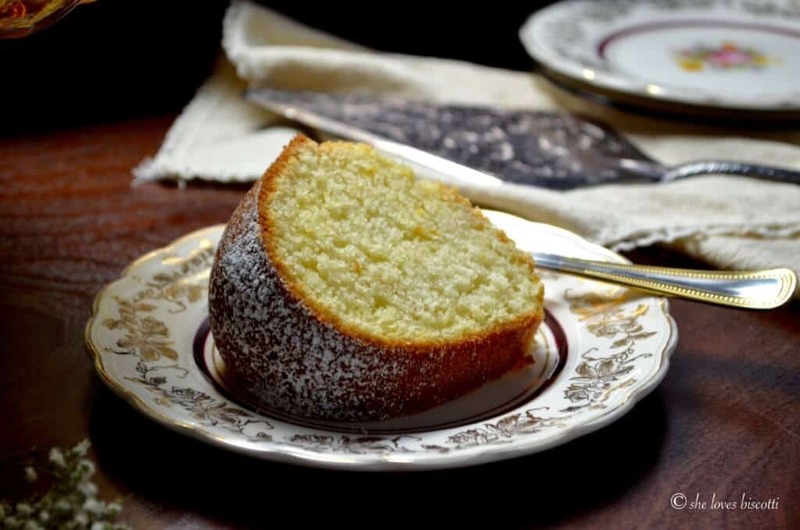 This Traditional Italian Citrus Ring Cake, also known as a Ciambella, is a ring shaped sponge cake. Simple.Classic. Italian. Grease and flour (or use non-stick spray) a 10-inch bundt pan. In a medium bowl,sift together flour, baking powder and salt. Set aside. In a large mixing bowl (of stand mixer) beat the eggs on high speed for about 3 minutes (eggs will become thick). Gradually add the sugar and continue beating for another 2-3 minutes. Reduce speed and add oil, milk and juice. Add dry ingredients, vanillin (or vanilla extract) and zest and beat only until combined. Bake in a 350℉ (175°C) oven for approximately 35 minutes or until cake tester comes out dry. *Vanillin can be substitued with 1 teaspoon pure vanilla extract. Hi there, I made this over the weekend. I have a hand held mixer. Would you still run on high? I cannot figure out the stand mixer compares to the hand mixer. My cake was pretty dry and dense. Wondering if I killed it with aggressive mixer. Thank you! That is a great question Traci. Yes, I would…I would say the two are comparable. My initial reaction would be that there was probably too much flour. The next time I make this citrus cake it I will use my hand held mixer, weigh my ingredients and update the recipe card. Appreciate your comment. This is an amazing recipe! Light, moist, a fine crumb, and very easy to make. I am really happy with it! The ingredients are simple and, each time I make it, it turns out beautifully. I also like the story you have posted with it. Thank you for posting such a wonderful recipe! Delicious! Super easy to vake a light and lovely cake. We have a lemon glut right now and this was a terrific recipe to use some. Molto brava! I am thrilled to hear this Cleo 🙂 How lucky to have so many lemons ♥ Thanks so much for taking the time to share your experience with this recipe, truly appreciate it! I made this yesterday for an Italian-themed dinner party, along with the suggested macerated strawberries. It was a huge hit! I can’t tolerate dairy, so I even subbed the milk with almond milk, and per another commenter, I subbed in olive oil for the veg. oil, which gave it the almost a savory depth that I was hoping for. When the cake was warm, I drizzled over a thick lemon glaze made with fresh lemon juice and zest and plenty of confectioner sugar, then before serving, I sprinkled confectioner sugar over the cake. Even the picky kids were coming back for seconds. The cake was fluffy, moist, and delicious, with exactly the right hint of citrus and not too sweet. I am absolutely thrilled to hear this! You have definitely brought this cake to the next level 🙂 Thanks so much for sharing your experience with this ring cake.